It was a warm, summer day in Springfield, MO. Belamour Barn is just outside of Springfield towards Willard, Missouri. The property sits on the corner of the road and is convenient for your wedding guests. This wedding venue has so many locations that we can use for the portraits. The wood pallets in the background look like any ordinary pallets but I loved the way they added to this wedding image. 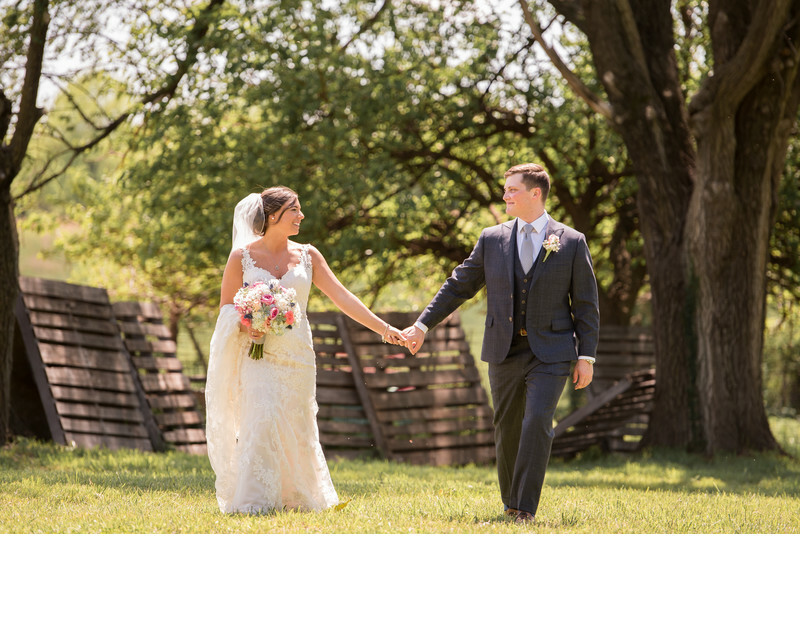 This bride and groom decided to have a first look before their wedding ceremony. We were taking their wedding photos when the sun was at its' highest point in the sky. When I know that I will be shooting portraits at high-noon, I don't run for the shade. I place my bride and groom in the sun with it at their backs. This opens up so many more locations that we can do their wedding photographs in. I told this bride couple to grab hands and stroll towards me like it was a normal day. I love the unposed interaction between them.